Talking with him on a Wednesday afternoon, we didn’t focus on his current pain or uncertain future, but instead walked through his past, through his humble beginnings, remembering what it truly meant for Suzuki to be free. 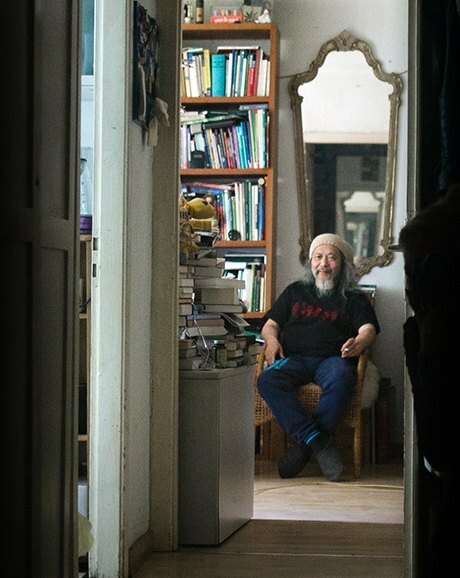 We talked about his life before he was enlisted to be the singer of one of the most influential krautrock bands to come out of Germany—a youth spent as a spiritual traveler and homeless drifter, busking through Europe in the late 60s. 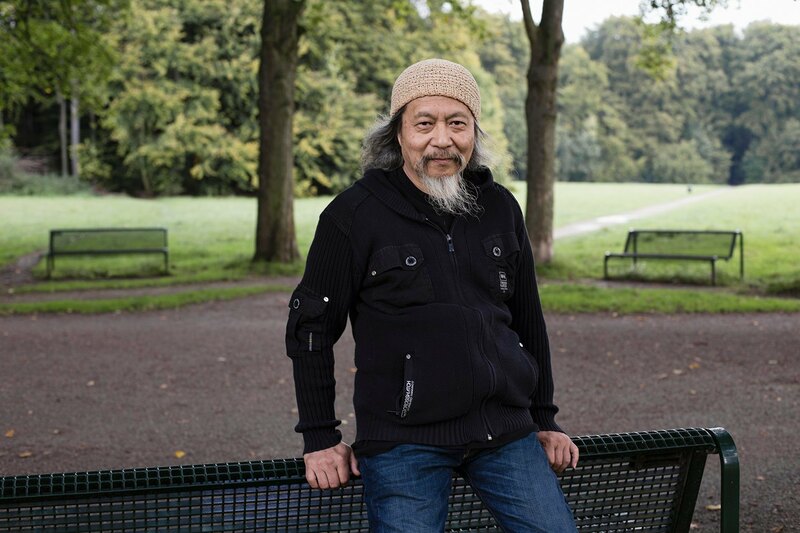 Here is Damo Suzuki, in his own words: “When I came to Sweden in 1968, I brought a clarinet, a saxophone, and my guitar and met a young man there and we formed a duet. We made folk songs which weren't interesting, but we did perform places, even once on local Swedish Radio. — is a genre of rock and electronic music that originated in Germany in the late 1960s, with a tendency towards improvisation on minimalistic arrangements. The term was popularized in the English-speaking press. Later, German media started to use it as a term for all German rock bands from the late 1960s and 1970s, while abroad the term specifically referred to more experimental artists who often used synthesizers and other electronic instruments. I first began busking when I left my girlfriend in Gothenburg. I didn't work anywhere, I didn’t even want to belong anywhere. I’ve always liked to have a greater sense of freedom in my life. And so I busked for one year, alone. I began in Sweden and then traveled to Denmark, Germany, and, finally, France. I didn't make good money busking, but I would busk when I didn't have enough to eat or travel to the next spot. I would busk about once every three days. It's not a good business, you don't make very much money, but it was not necessary for me to have that much money to sustain my lifestyle. In the wintertime, I would find other ways to make money, like working at a restaurant or on a farm. My busking was largely about improvisation. I had composed some pieces, but I couldn’t play guitar well at all. I would do some improvisation with only two or three chords. I had to do something to survive. I also made comics. They were always my own comics, I never tried to cover anybody else. 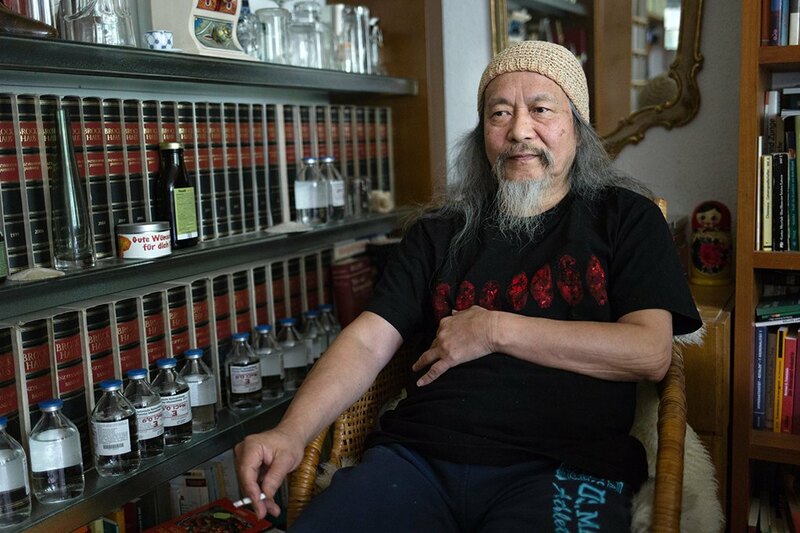 Damo Suzuki sits for a portrait at his home in Cologne, Germany, September 2015. Photograph by Birte Kaufmann for Hopes&Fears. I think I was quite strange-looking that time. I had really long hair, and I think a lot of people watched me because they were curious about who I was. I don't know if anyone actually enjoyed it. They were curious about me because it was the end of 60s and in this period, there were not many Japanese people, or Asian people, in general, in Europe. I had an androgynous look, so people would wonder, ‘Is it a girl or a boy?’ They watched me as if I were an animal in a zoo. They weren’t interested in hearing my music or songs, they were just curious about who I was. Every other busker played far better than me. Many of them were professionals. I wasn't good at all, but maybe some people liked it because it was more unique. When people play perfectly, it's not always good. They must have something different about them. I remember one good performer from my past. He was quite old, probably around the age I am now. He dressed like a hippie from an ancient time. He played his own instrument, which he made himself. It was pure noise on the street. Most busking is covering someone else’s songs, but this was different. Every country is totally different. Nowadays, the situation is a lot better. But some countries had horrible police that cracked down on hippies. In Paris in July of 1969, I was just walking down the street with my broken guitar and sleeping bag and the police arrested and held me for five hours just because I had long hair. There were a lot of abruptly shortened busking days because the police would show up and throw me in jail. I would always busk on the main street of a city. Sometimes I would get in trouble because some smaller cities, like in Sweden for instance, have narrower thoroughfares and when there were too many people, there would be a traffic jam. Then the police would come and tell me to go elsewhere. But I liked the central areas because there were many different people to see. It's not really a good business, but I was just happy to get some bread for the next day and have a place to sleep. I met a lot of nice people, too. This was the most important thing for me at that time. I met so many interesting people who supported me and who would let me stay with them. The times were different. There was so much more communication and real connection than there is today. I have a lot of memories. If I close my eyes, I can see a city and a person who helped me. Sometimes I can remember faces from forty-five years ago. I'm sixty-five now. Normally people don’t remember so much. It's almost like a movie. Every three days or so, I was moving from one living situation to another; another person, another place. For instance, I met this older lady, she was maybe forty-years-old and living alone. She kept asking me if I would come live with her and so she could treat me as her son. Once, in the north of France, I met two Irish girls on the street. They asked me, "Have you been to Ireland?" I said, "No. Never." And so they asked me if I wanted to go there with them. Of course, I agreed. I had never seen Ireland before. It was 1969. I stayed there from the end of August until the end of the year. But I didn't stay at their place in New Ross, Wexford the whole time. Their mother was a really nice person. She had eight kids, but even so, she was so kind to me. She was like a second mother to me. She died a couple of years ago. I got to see her before she passed away. After forty years apart, we saw each other again. She was in her late eighties or maybe early nineties. She told me, "Damo, you have long hair. That's good." She always used to say that to me. And one of her daughters brought out these materials that I used to use when I was painting or writing a poem at their place. She had saved this whole box of materials from 1969. After I stopped busking, my life was completely focused on music. I met the other members of what would become CAN after being involved in a theater production called Musical Hair in Munich. I had been quite bored because every day was the same for me. I was making quite a bit of money at that time, but I was frustrated. And so I made some happening on the street. I can’t remember what I did, but it must have been quite loud, otherwise they probably wouldn’t have seen me because I’m a fairly small person. Most people couldn’t see me if I didn't make a lot of noise. But the band noticed me and asked me if I would sing with them that same night. They had a concert at a big discotheque. The rest is history. When I was busking, I was not “making music” but I was really living. I felt really totally free and not involved in any particular scene. I was just alone. Every day, I had a new experience. There were no stages, just the street. It felt really good. It's truly a treasure to have such an experience in life. It's comforting in a way to do something that people generally haven’t done. I think I'm still living this way. I'm making music now, but still I’m not working within the industry. I don't have any managers. I arrange my own concerts. I like this kind of freedom. If you are really a free person, you don't copy anybody. You try to make a life on your own terms. To be as free as possible is to not belong anywhere or to anybody. Just trust yourself. It’s better not to have too much information because if you have too much information, you are losing a lot of your own creativity. You have to unlearn things, and just make your own experience from scratch.